Too often, we see people on multiple day backpacking trips that, aside from looking like they are packed for a 3 week excursion, their packs are obviously packed improperly – gear strapped in on every possible place outside the pack and nothing packed inside; 5 lb tent packed on one side, pots and pans dangling on the other side, clanking with every step. You name it – we have seen it! 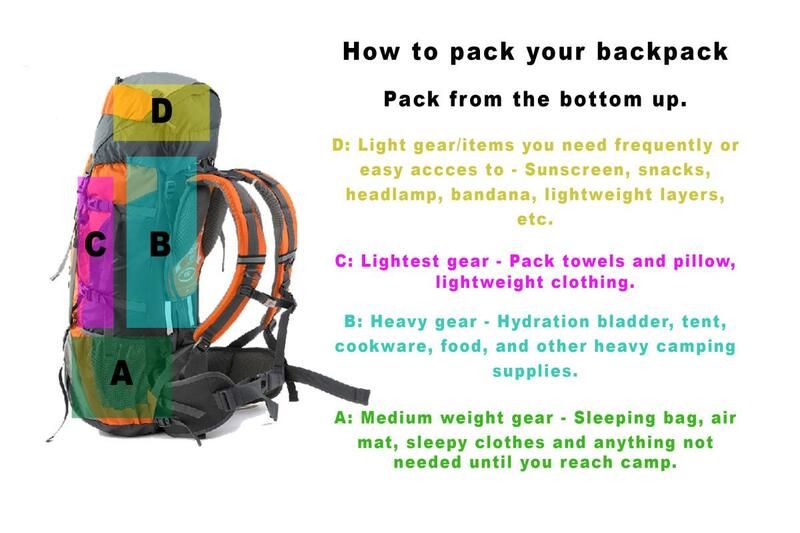 So to save your back and yourself from several days of torture, here are some tips (and a super cool graphic) on how to properly pack your backpack. 1. Organize and lay out everything you are going to pack in one area so that you can prioritize what goes into the pack first and in order after that. use the graphic to categorize based on what gear goes where (A, B, C, D). 2. The majority of your items that go in the main compartment of the pack (D, C and B) are items you should not need while hiking to your destination. Pack these items first. 3. When packing your heavier items, keep the heaviest item along and closest to your spine. If you pack has a pocket for your hydration system, use it since that is the heaviest item you will have. Use the placement of the hydration system as a placement guide for your other heavy items. 4. A tip for packing your tent – pack the tent and poles separately. This way you can compress the tent into the pack and the poles (since they are typically lighter than the rest of the tent, can be packed long ways to one side of the hydration bladder. 5. Pack the things you might need easy access towards the top of your pack’s main compartment – clothing layers for example. 6. Use the exterior pockets and top pocket of your pack for your easy access items that you will need on the trail such as a first aid kit, sunscreen, snacks etc. 7. As you are packing, try to distribute the weight of items so that the pack is evenly balanced from side to side. 8. If your pack has a separate sleeping bag compartment, stuff your extra changes of clothing (underwear, socks, etc) into the spaces not used up by your sleeping bag and air mat. Many times there is space in that compartment that goes unused so fill it up. An internal frame pack is made to compress items so they fit tightly in your pack. If items continuously shift while hiking, you will need to keep adjusting your gear. This makes for a long hike. Don’t be afraid to cram your stuff into the pack. A few exceptions to carry outside your pack – closed cell foam mat like a Therm-A-Rest ZLite (or any mat that does not compress to fit in a pack and is lightweight), campshoes or items that are lightweight and bulky. Use your straps! Packs have a lot of straps. They are not there for decoration. Be sure they are all clipped properly and pulled tight so all your items are compressed and secure. Overall, the goal of packing the pack is to have what you frequently need be easily accessible while at the same time having the weight of the pack lower and closer to you so that the weight of the items in the pack aren’t pulling you backwards. It may take some packing and repacking until you get the backpack to feel balanced and not top heavy but once you get the system down, you can avoid an aching back, sore shoulders or a limp. Looking for more expert advice from Just Roughin’ It? Click here!